Kickstarter Update #74 has just been released for the end of August. 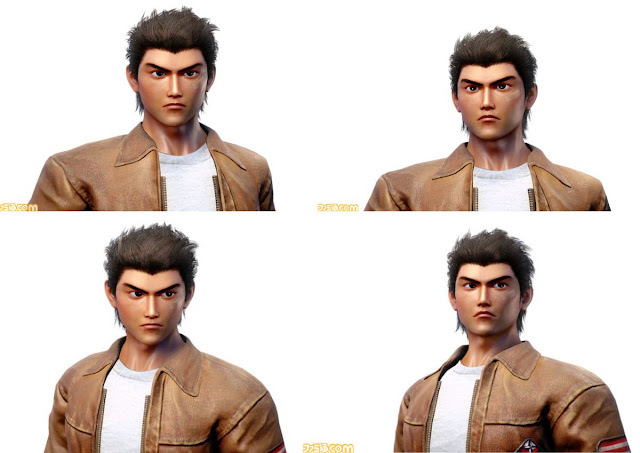 In addition to some photos of the recent Gamescom event and a message of thanks to Shenmue fans for their support, of particular interest are these three new images of Ryo which were not released at Gamescom. For the first time, we get to see Ryo standing on the main street of Choubu. Check out the images below (high-res versions; click to enlarge). 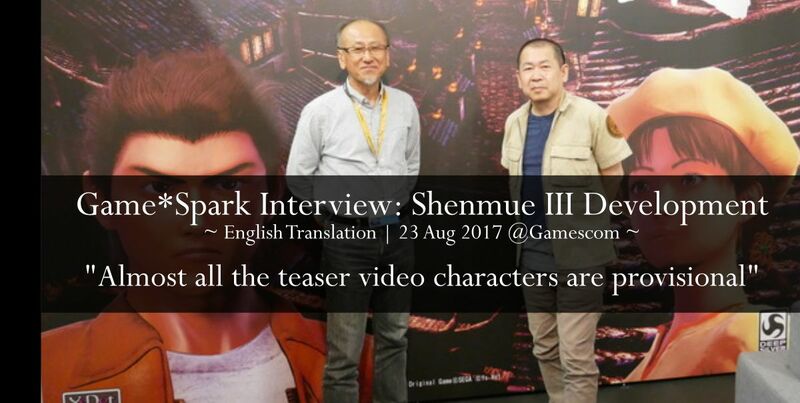 The Shenmue III teaser video that was unveiled at Gamescom contains several scenes and images, many of which flash pass by in an instant. In this post we'll pause and take a closer look at seven points within the teaser which hint at promising depths beneath the surface of the game. Shortly before the camera sweeps down through the main road of the riverside town of Choubu, a line of colorful and distinctive masks is shown - presumably merchandise for sale at one of the shops Ryo will be able to visit. Masks of other designs can be observed in the background. Masks on display in Choubu. 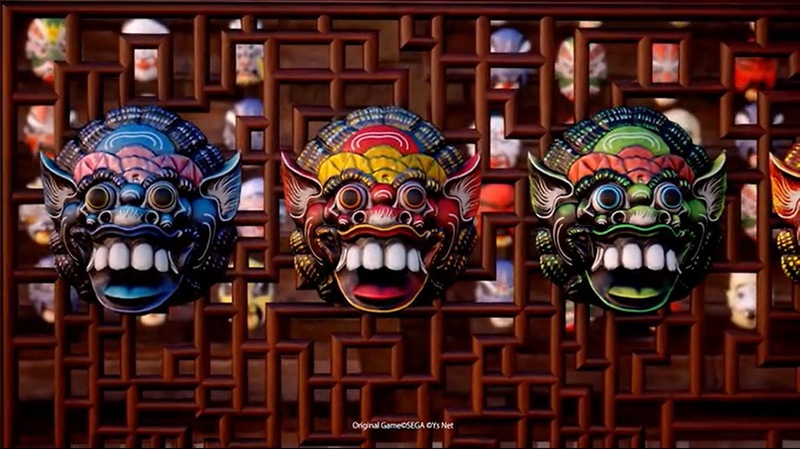 It turns out that the design of these particular masks, which are carved from wood, originates from the Indonesian island of Bali. 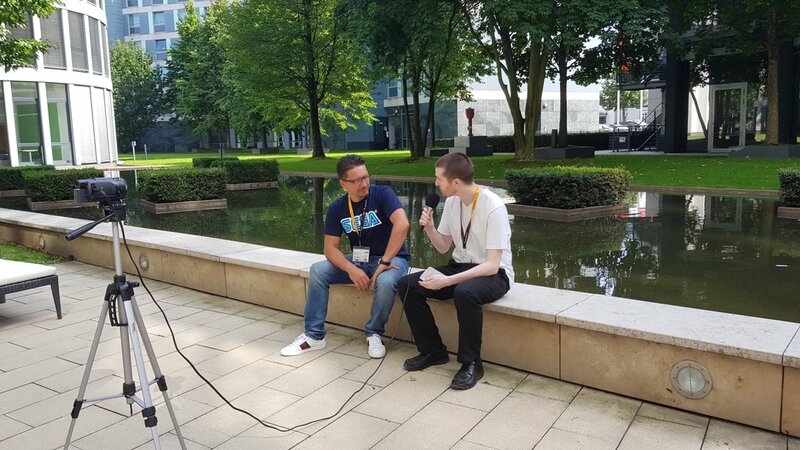 While in Cologne for Gamescom last week, Team Yu spoke with Cédric Biscay, President and CEO of Shibuya Productions and co-producer of Shenmue 3. In the interview, Cédric talks about topics such as Shibuya Productions' role, the new Shenmue III teaser video and why Shenmue I and II remasters need to be released by SEGA ahead of Shenmue III. 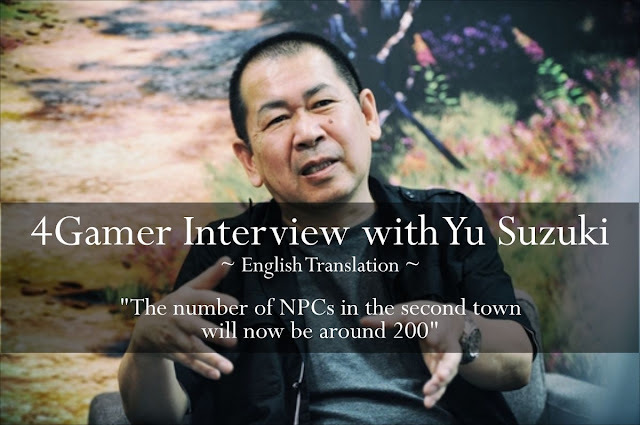 Watch the 10-minute interview video below, or read Team Yu's summary write-up on Facebook here. For information on how to participate in the #SaveShenmueHD Tweetathon on the 3rd of every month, head over to the Team Yu website. We're pleased to present another fresh interview with Yu Suzuki from the Gamescom event, this one by the Japanese site 4Gamer. The interview translation begins below. Release Date Extension For a "Pretty Positive Reason"
Q: Thank you for your time today. To get started right away, there was a teaser trailer released to the public for Gamescom. Why Gamescom and not E3? YS: If the contract with Deep Silver had been completed prior to E3 2017, that might have been an option. Time was needed for the final signing, so the trailer's release timing ended up being Gamescom. 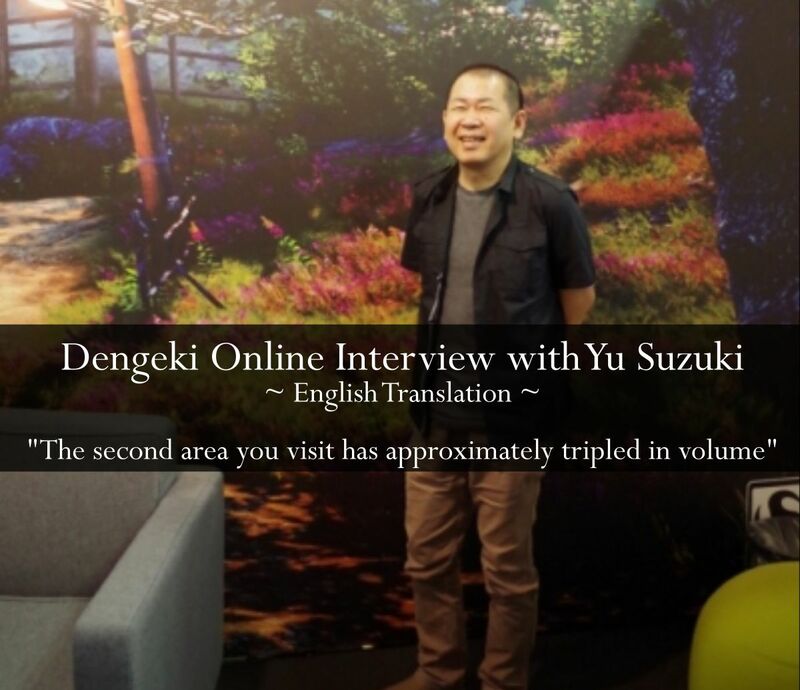 This is a full translation of an interview that was held with Yu Suzuki by Dengeki Online at the Gamescom event. Q: How is the current state of development? YS: Progress on the environments and stages is very good. I would say overall they're at around 70%. Lighting settings are also in good shape, and we're now adjusting the indoor lighting. We're still at the stage of fine-tuning for dealing with changes over time. This is a full translation of an interview that was held with Yu Suzuki by GAME Watch at Gamescom on August 22nd, 2017. Q: I have really been looking forward to today's interview, and getting the chance to ask you about Shenmue III after so long. YS: Would you like to watch the video? Not the 90-second version released on the internet, but the long one that's two-and-a-half minutes. 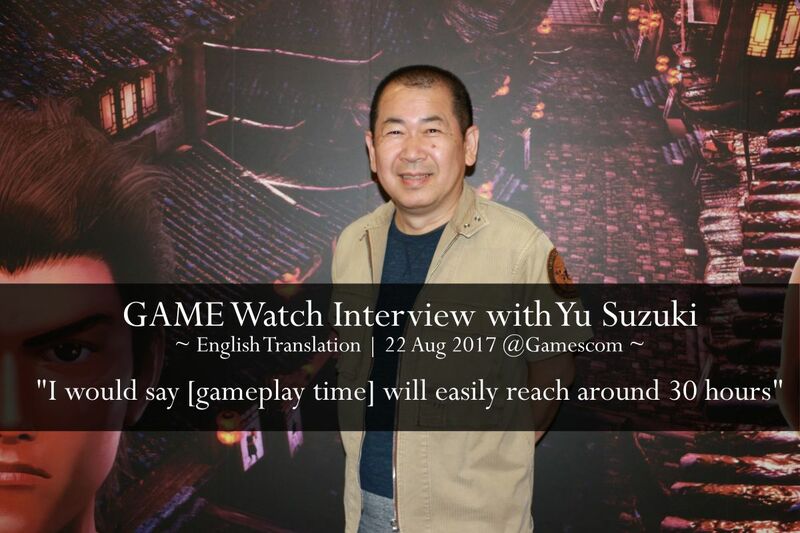 This is a full translation of an interview that was held with Yu Suzuki by Famitsu at Gamescom on August 22nd. (The accompanying images are not from the original article). Q: To start with, could you tell us about the current state of the development? YS: When we announced the revision to the release schedule the other day, our discussions with Deep Silver were already advanced. 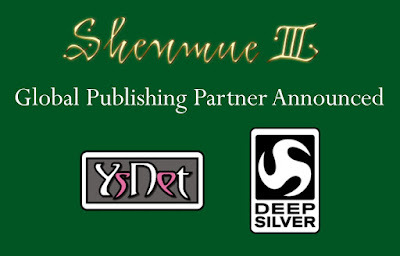 With Deep Silver to become our partner, I realized that we would be able to aim even higher than our initial goals. However, for that additional development time would be needed, so in order for us to adopt these, I set the release timing to the last half of 2018. 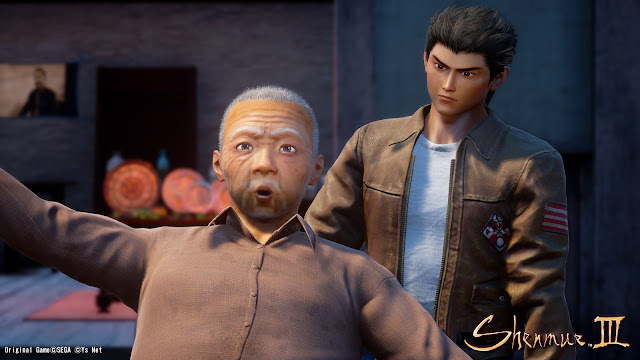 An intriguing new image has been released among the Shenmue III screenshot images on the Japanese site Game WATCH that I have not seen elsewhere. Although no comment is provided, it appears to show the Shenmue III title screen in Japanese: the golden Shenmue III logo (using the new design, and in Japanese characters) over the backdrop of a dragon and phoenix motif. 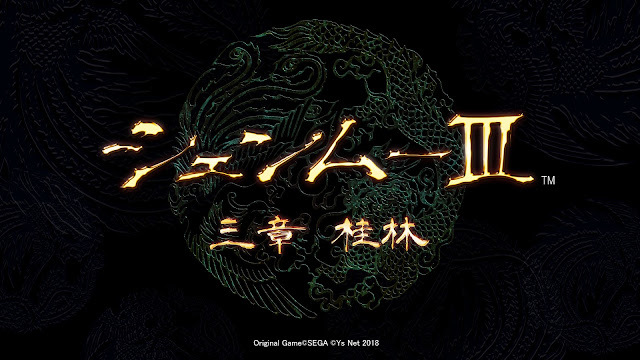 Beneath the main title are the words (in Japanese): "Chapter 3 Guilin". 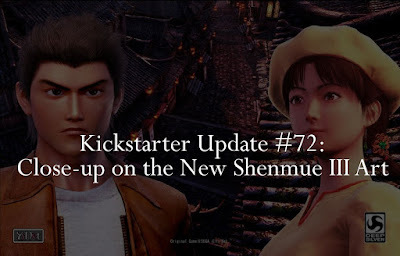 This subtitle suggests a return to the style of naming of the first game - where the game's full name in Japanese was "Shenmue Chapter 1: Yokosuka". It would make sense for the public numbering to be separate from the mysterious internal chapter numbering that Yu Suzuki is known to have assigned to various sections of the game's story. Just looking at the screenshot, you can almost feel the motif spinning before your eyes, ready for Ryo's adventure to continue. 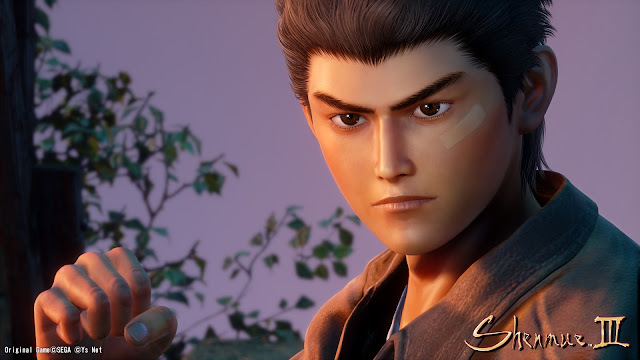 In addition to the set of images of Ryo and Shenhua (see previous post), a new set of in-game screenshots has been released. The first shows what appears to be a new character, in the form of a grey-haired elderly man, while others are a mixture of scenery and character screenshots. Update: this post originally contained images sourced from the Japanese site Famitsu, however a PlayStation blog post contains higher-resolution versions, so the images in this post have been refreshed accordingly. Ryo and a grey-haired old man - learning a new martial arts move? A new set of images of Ryo and Shenhua was posted up today on Famitsu.com, accompanying their brief article about the recent Shenmue III trailer release at Gamescom. 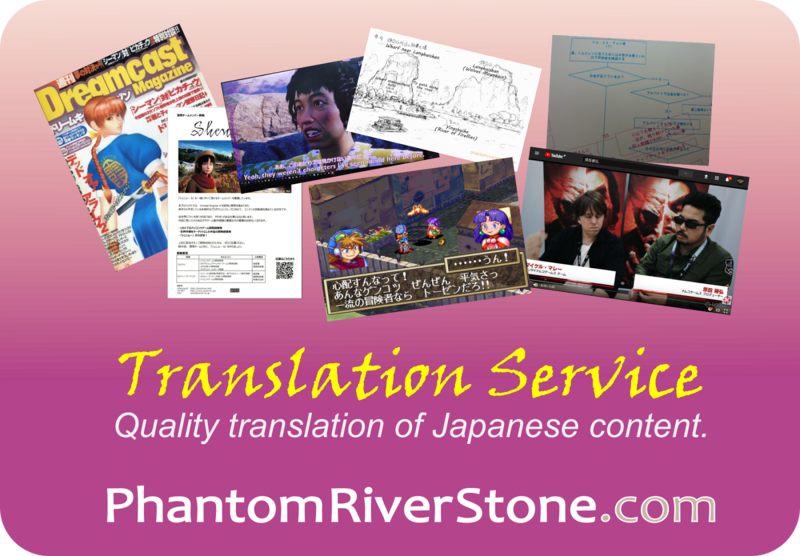 The article, which is in Japanese, is brief and does not contain any specific comments on the images. Check them out and leave comments below. 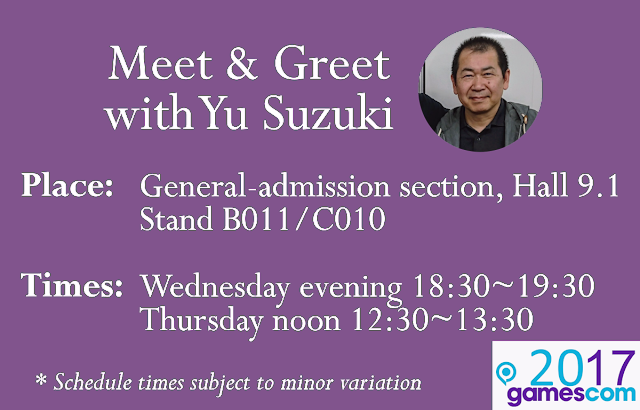 Here is a selection of recent photos of Yu Suzuki's journey to Gamescom, hot off the Twitter press. Yu Suzuki departed from Haneda airport (picture in this previous post) outside Tokyo on Sunday evening, arriving in Frankfurt the following morning. From there he caught the ICE high-speed train and arrived at the Gamescom event venue in Cologne. 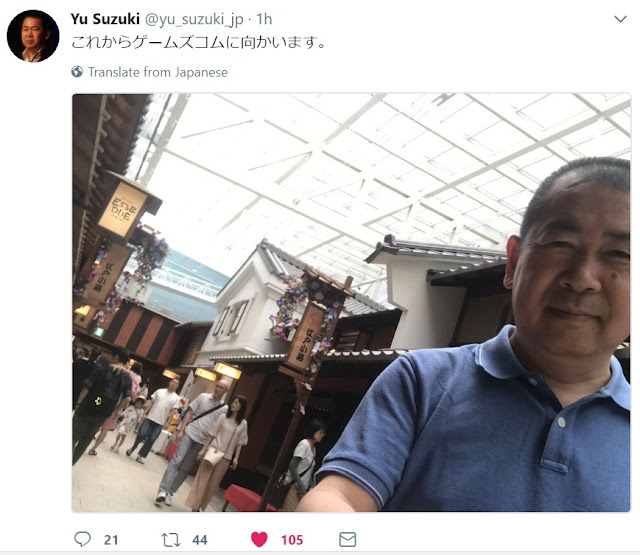 The first two photos are from Yu Suzuki's own Twitter account, and the last two were posted by a member of the Deep Silver team, Will Powers. Yu at the station platform at Frankfurt airport terminal. 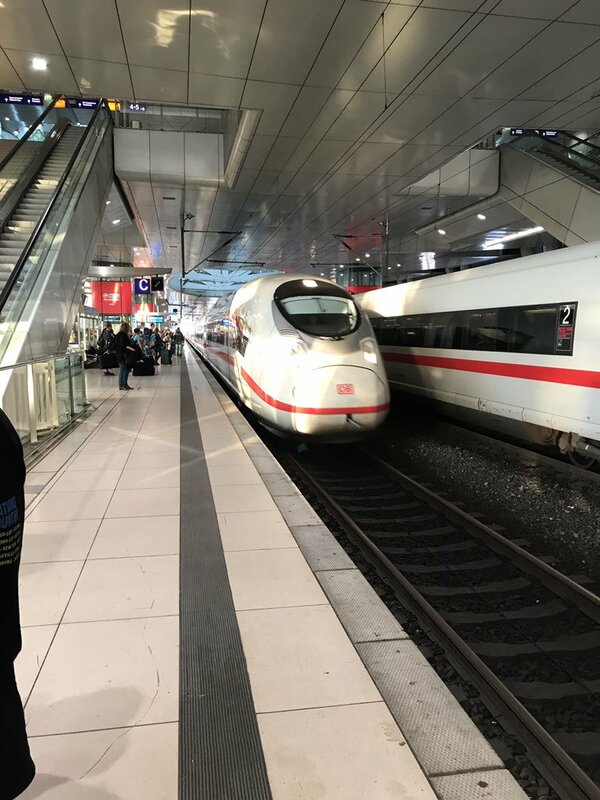 Twitter message: "Heading for Cologne by train @Frankfurt". Having got the "real-world" focused updates from the recent Kickstarter update #72 out of the way in previous posts (namely, the confirmation of Yu Suzuki's meet-and-greet schedule at Gamescom and the announcement of Deep Silver as publisher), in this third post we at last turn to an aspect that relates entirely to the Shenmue world - in the form of the surprise inclusion of new art from the game, contained in the press release material. A benefit of waiting a day or two before posting on this topic is that I have had time to examine the images carefully and let my thoughts settle. Let's run through the new images, as sourced from the press releases. Yu Suzuki has just tweeted this photo of himself, captioned "I'm about to head to Gamescom". Behind him is the Edo-themed restaurant and souvenir area of the Haneda international airport terminal. 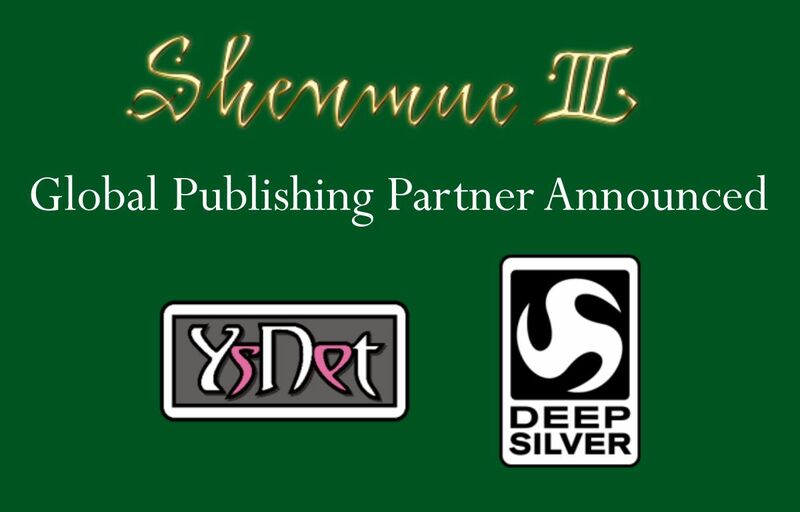 One of the major announcements in the latest Kickstarter update is that YS Net has formed a contract with Deep Silver, a company headquartered in Germany and owned by Koch Media, for publishing Shenmue III. The press release states: "The global publishing deal will cover the release exclusively on [the] PlayStation 4 computer entertainment system and PC, both physical and digital versions." 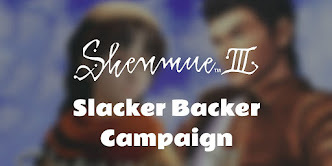 We are now heading into the last few days before the Gamescom event in Cologne (Aug 22~26, general admission from the 23rd) in which Shenmue III will be participating, and a new Kickstarter update has just been released that has set social media and fan sites buzzing. New art from the game revealed! In this post we'll take a look at the first, with the other topics to follow in separate posts. With our recent Shenmue Passport disc hack, some interesting sections of the disc can now be easily accessed. One of these is the Data Review section, which spits out statistics on almost every imaginable aspect of a played game, from the number of game saves made, down to the number of times Ryo has walked into a wall(!). Ryo's Present Goal is displayed on the Data Review screen of Shenmue Passport. 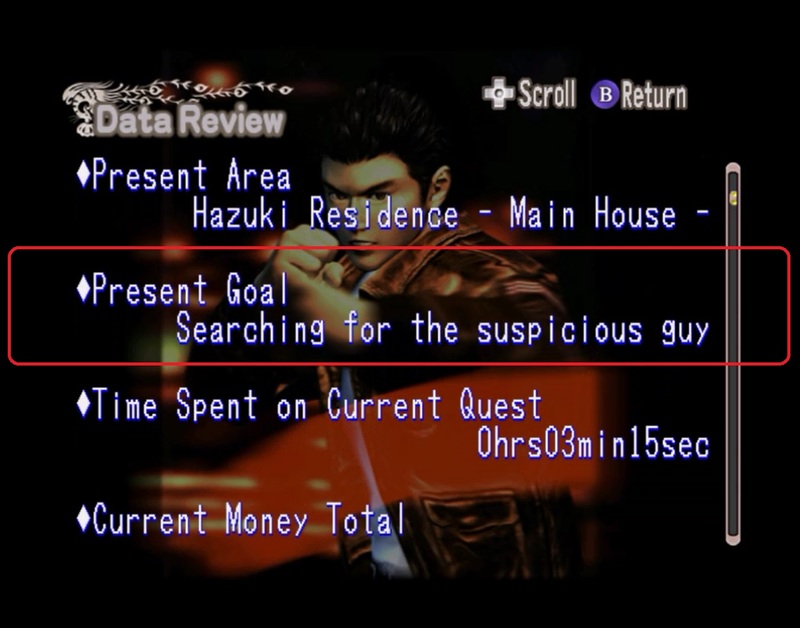 Below is a list of all the goals, extracted from the Shenmue Passport disc. Reading through makes you appreciate the amount of effort Ryo - and you, the player - expends in the first game in his hunt for Lan Di! 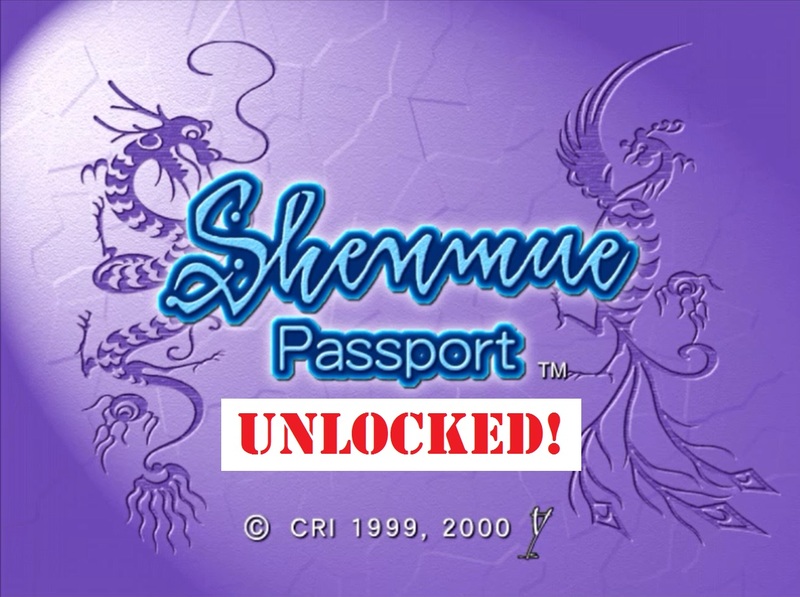 I'm excited to be able to share a hack I've put together which allows easy access to the online section of the Shenmue Passport disc - without the standard requirement of a Dreamcast console + internet connection. 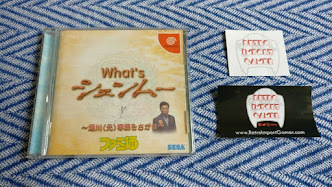 It is in the form of a small, targeted patch to apply to the Shenmue Passport disc which effectively skips the check for an internet connection, thus allowing the "online" section of the disc to be accessed and browsed (to the extent possible while offline). Read on for an overview of the unlocked content - and see the end for simple instructions to patch the Shenmue Passport disc image. The talent and creativity of Shenmue fans know no bounds! Demonstrating this are these two recent fan-made projects that have been inspired by the game: one is musical and the other visual art. 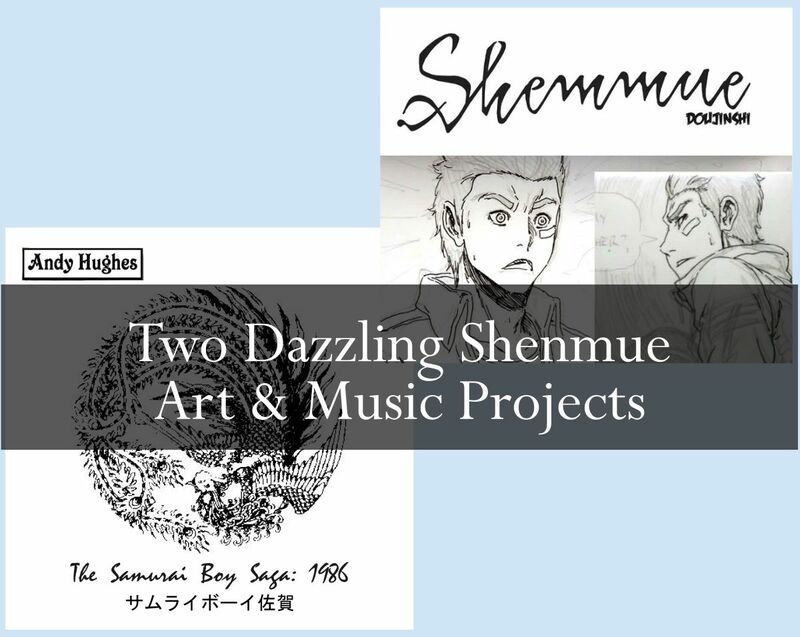 The artists' love for Shenmue shines through in the care and attention given to the works. Links are provided in the descriptions to find out more about each. So, let's get started!